This is “Deogi” made by Dollstown. 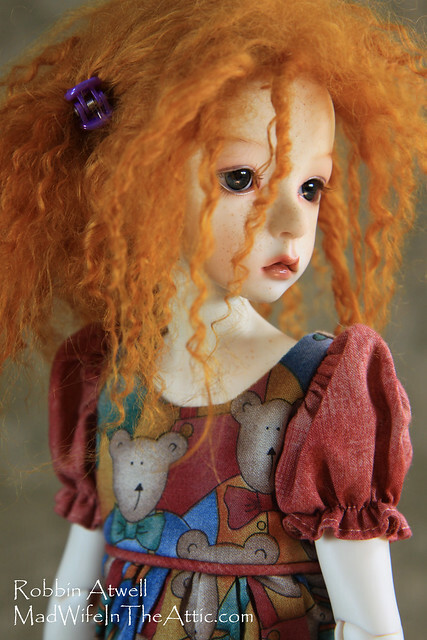 She is a resin BJD and she’s about 16″ tall. Her resin color is called Freshskin which resembles bisque. Her wig is custom made for her — it is Tibetan lamb and the entire wig was curled on pipe cleaners for a head full of ringlets. I painted her for my friend, Monica. Since I took pictures through the process, I thought it would be interesting to see how the various layers of color create her final look. I depend on layering to make pretty eyebrows and lips. Start by shading the area with pastels. Continue to add pastel and paint in a range of colors. As you build layers, you get the look of depth and avoid the dreaded “caterpillar eyebrow” and the flat lipstick mouth look. Don’t let an area get too dark — I find it nearly impossible to lighten my coloring. Color can always be added, but removing color usually means wiping a face and starting over. I took dozens of pictures of this girl and I had a difficult time selecting only a few to publish. She’s a very photogenic little doll. Here are a few of my favorites and there are many more on Flickr. I love this picture because she looks like a real girl — she seems to have a personality and you can barely see the tell-tale joints. This mouth was surprisingly difficult to paint — I didn’t expect it. The lips are parted but there are no visible teeth and the corners are deep and asymmetrical. I got way too much dark color in the mouth and in the corners at first. I couldn’t undo it and had to start over. 25 Aug	This entry was published on August 25, 2014 at 8:59 pm. It’s filed under BJD Faceups, Doll Making, Doll Wigs, Tips, Uncategorized and tagged ABJD, Ball Jointed Doll, BJD, Deogi, Doll, Dollstown, Faceup, Kish, Mad Wife In The Attic, Monica, Painting, Resin, Robbin Atwell, Robbin with 2 bs, Wig. Bookmark the permalink. Follow any comments here with the RSS feed for this post. 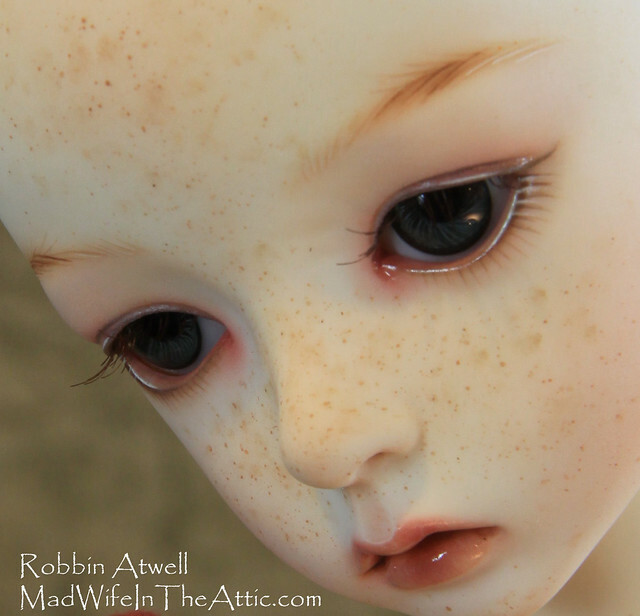 I’ve followed Robbin Atwell for some time, being particularly interested in how she, as a non-Japanese/Korean, interprets girlish beauty on BJD faceups. In the earier post about Mia Hays I mentioned in particular the large features on a small face: while “anime eyes” are obviously exaggerated, Mia’s features in terms of space between bottom lip and chin, space between eyes, distance from outside of the eye to ears, etc., are not so dissimilar from those of the “Deogi” doll whose face Robbin so expertly creates. Looking again, I was taken by the strength of the fulcrum, and how sensuous it seems to make the mouth, and also how cute she is with freckles and red hair! And this is just another example of why I ALWAYS have the MadWife do my face-ups.